You've got to be careful if you don't know where you're going, because you might end up someplace else. This is a brief journal of my winter 2007 road trip. I greatly enjoyed my motorcycling adventures traveling the US and Canada 10-15 years ago and My 2006 Road Trip to the southwest last winter was meant to be the beginning of a long series of adventures. This is the second trip in that series. I'm dividing this journal into separate pages for each week to keep them more manageable. My motorcycling about the country was done traveling light and off the beaten path with a tent and sleeping bag strapped on the back. That works beautifully for a month or so at a time in the summer. Now I'd like to stay on the road for several months at a time, for now mostly in the fall, winter, and early spring. A small RV seems to be the way to go and the focus of this road trip is about learning what I can of the RVing world and hopefully finding the right RV for a whole series of adventures. Who knows, maybe I could even try full-time RVing in a few years. The limited online research I've done tells me I should be looking at Class C motorhomes and the Lazy Daze brand in particular. There is currently an older Lazy Daze for sale in Memphis TN so Memphis here we come. Via Columbia Co route 9 south to Ghent NY then NY 66 south to Hudson NY then NY 23 west across the Rip VanWinkle Bridge to Oneonta NY the I-88 south to I-81 south to Hagerstown MD - 407 miles. It's a good thing I left Monday. I wasn't quite ready but saw weather reports indicating the midwest was getting hit with a major snowstorm, And it was headed east toward the Washington DC area. As it is I just barely got round the nose of the storm. If I had waited a day I would have been in a mess. As it is I stopped for the night in Hagerstown MD and should have kept going another hundred miles or so. It was snowing when I left Hagerstown on Tuesday. Via I-81 south to I-40 west - 449 miles. It was snowing when I left Hagerstown MD Tuesday and the roads were starting to get a bit slick. Schools were closed all over the area. Soon enough I escaped the snow and it rained off-and-on all day. Not a lot of fun driving but from what I've been hearing far better than the heavy snow storm I managed to escape. It turns out the mid-west and much of the east is snowed under. Via I-40 west - 442 miles. Surprisingly there were snow flurries off and on most of the way to Memphis. But I made pretty good time anyway and arrived in Memphis about mid afternoon. I had planned to wait until Thursday to visit the folks with the Lazy Daze I am interested in looking at but since I was not too tired from the days drive I gave them a call. They were home and I got a good long look at their rig Wednesday afternoon instead. This Lazy Daze certainly seems well constructed like their the enthusiasts claim them to be and I think this one might suit my needs and budget quite well. I need to sleep on it. The rig has a few problems that need attention and even though I'm enthusiastic does it make any sense at all to buy the first one I see? Scary thought that is. Via local roads - 42 miles. Thursday afternoon I spent some more time looking over the Lazy Daze and finally convinced myself it really is what I'm looking for, that it is in basically good shape, that the problems I've found can be fixed (the big thing is a leak into the wall behind the refrigerator which I judge to be fixable but at some expense), and that in spite of standard cautions it's ok to buy the first one I see. So I made the owners an offer. Now it's their turn to sleep on it. Via I-40 west to US 79 south to US 82 west - 363 miles. Friday dawned beautiful, the kind owners of the Lazy Daze slept on my offer and we have a deal. The logistics of getting the Lazy Daze registered and inspected in New York and dealing with the huge snowstorms in the northeast would pretty well finish my trip for the winter. So I've decided to leave the Lazy Daze here and carry on with my trip and come back for it in late March or early April. Westward we go. Via US 59 south - 276 miles. Livingston TX is headquarters of the Escapees Club. 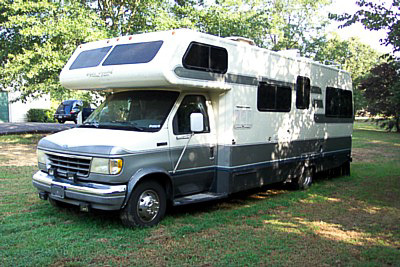 This club is dedicated to the full-timing RVing crowd and provides many parks and services. I thought I might check it out as long as I'm in the neighborhood to see if those services might suit my future travelers life. What a huge disappointment the neighborhood turned out to be. Miles and miles of low, flat pine and scrubby lands sure don't appeal to me. The Escapees park is nice but I couldn't imagine spending much time here. Via US 190 west to I-10 west - 559 miles. This turned out to be a long long day of pine and scrub soon turning to miles and miles and miles of gently rolling dull brown and green scrub, a few cows, more sheep, a few goats guarding the sheep, a few horses now and then, here and there an oil patch. Whew! is all of Texas like this or just this 500 miles swath across the middle? Sorry Texas, but it may take some doing to get me back here to find out.